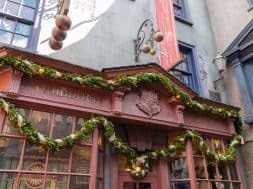 We’ve had a few weeks now to check out the new (and absolutely stunning) Christmas decorations at both Hogsmeade and Diagon Alley. Now it’s time to sink our festive teeth into the remaining Christmas in The Wizarding World of Harry Potter items that we have yet to experience in one shape, way, or form already – most especially The Magic of Christmas at Hogwarts Castle, the brand-new projection-mapping show that transforms the ancient castle into a winter wonderland. 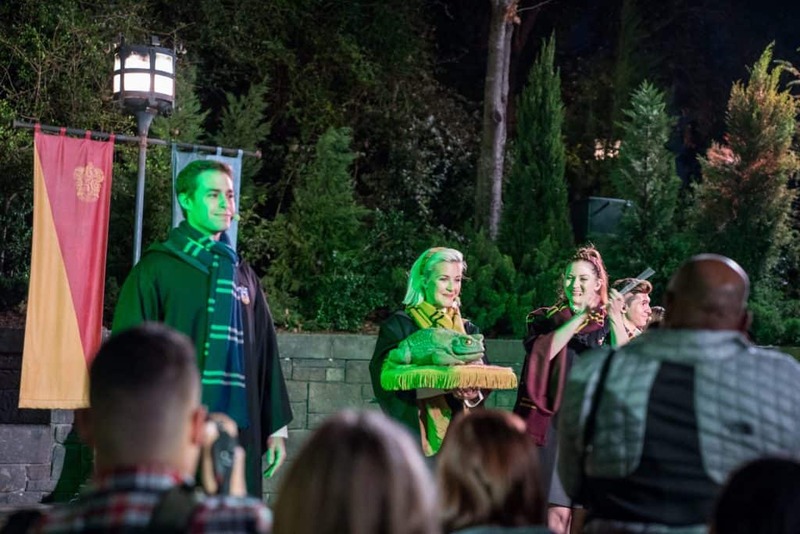 Fortunately, Universal was nice enough to provide a sneak-peek of that and more, as it held a media preview of the entire wizarding holiday program tonight. 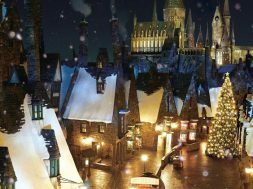 We were blown away by the new Hogwarts show, but we also found ourselves enjoying all the rest of the yuletide offerings – suffice it to say that 2017 will, indeed, be the best Christmas yet for Universal. Let’s run down all of the entertainment options. Wands at the ready, everyone! 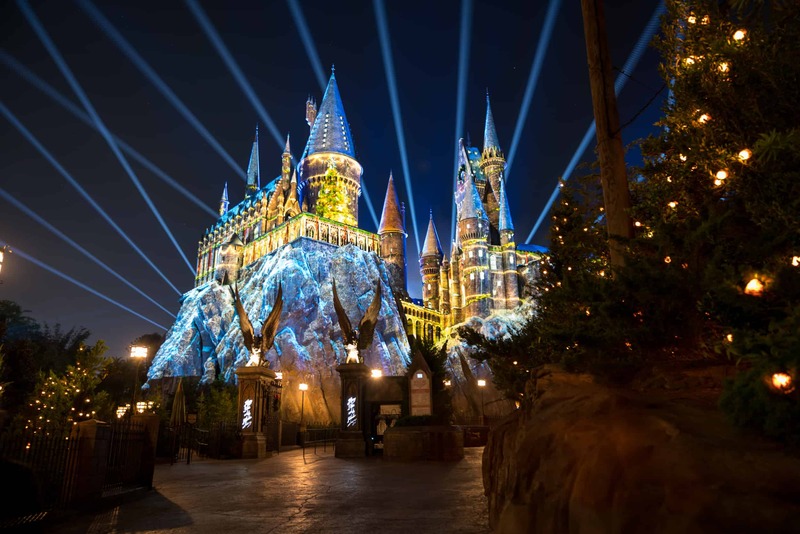 It wouldn’t be Christmas, of course, without music, and Universal, it turns out, has both traditional favorites and brand-new (wizarding) carols lined up for guests to enjoy during the Wizarding World’s seasonal celebration. Call it the best of both worlds, muggle and magical. Let’s stop by Diagon Alley first for our sonic yuletide fix. The Singing Sorceress Celestina Warbeck and the Banshees have decided to grace our non-magical ears with four of their greatest hits from their chart-topping Christmas album, Nothin’ Like a Holiday Spell. What’s wonderful about this roster is just how different they all are from one another – the titular “Nothing Like a Holiday Spell” is a standard Celestina song (like you’d hear during one of her regular performances), while “My Baby Gave Me a Hippogriff for Christmas” could easily be mistaken for an old-fashioned holiday jingle, and “Accio Christmas” veers completely off the beaten path and delivers a Jamaican-esque calypso tune. Not only is there bound to be something here for everybody, it’s all very refreshing and provides a wonderfully unexpected variation on the Christmas theme. But what really puts this version of Celestina over the top are all the extra little touches that are deployed throughout. Both Ms. Warbeck and her Banshees are decked out in their Christmas best, as is the stage they perform on, from the decorations to the nicely-rendered holiday poster that sits in the background. And then there’s the snow that magically begins to fall midway through one of her songs, which drifts down around you to make for an incredibly immersive moment. We didn’t think it was possible, but all of these details in and of themselves make Celestina Warbeck even better – and once you throw in all the Christmas songs, it’s taken to a whole new level yet again. The students of Hogwarts School of Witchcraft and Wizardry over in Hogsmeade couldn’t possibly let pop sensation Celestina and the Banshees have the Christmas spotlight all to themselves, could they? However, whereas the holiday Diagon Alley show comes across as a different production, thanks to all the extra layers that were added onto the basic version, the Frog Choir’s Christmas concert can’t help but feel like just another performance (the students’ stage is a more straightforward affair than Celestina’s, after all, which we’re sure accounts for the lack of any special décor). But that doesn’t mean that their festive lineup of songs – which includes “Christmas at Hogwarts,” “The Most Magical Yule Ball of All,” and “I Cast a Spell on Father Christmas” – isn’t fun or otherwise worthwhile, and the choir still manages to deliver them in characteristic pitch-perfect style. Plus, unlike with its counterpart over in London, the Frog Choir manages to sneak in a traditional muggle classic: “We Wish You a Merry Christmas.” There’s something undeniably delightful about hearing the familiar carol but with the extra flourish of frog-puppet bass notes, there in the otherwise-fantastical Wizarding World. 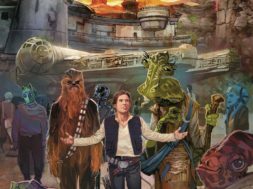 It served as the perfect finale to the show, and one that put a big smile on our faces. The lights around Hogwarts Castle, home of Harry Potter and the Forbidden Journey, go down. The assembled crowd collectively catches its breath. And then, before you know it, ghostly carolers appear floating on the castle, serenading their muggle admirers. Then we’re off, watching snow fall, seeing the Weasleys’ car careening through the winter night sky (and through giant snowmen), and delighting as Hogwarts students zoom about the iconic structure on their broomsticks, making (short-lived) snowmen as they go. 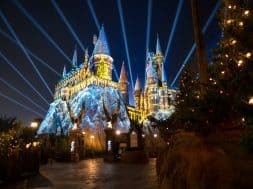 There are actually quite a few nice little moments in The Magic of Christmas at Hogwarts Castle that, just like the Wizarding World’s holiday decorations, it can be easy to miss them upon first blush. Fairies fly around you and then create a majestically-large Christmas tree that takes up the castle’s main turret. There is a loving recreation of the Yule Ball, replete with a waltzing Hermione Granger, Viktor Krum, and Albus Dumbledore, done in a style that is reminiscent of the Tale of the Three Brothers segment from Harry Potter and the Deathly Hallows, Part 1 – that is to say, almost origami in appearance. 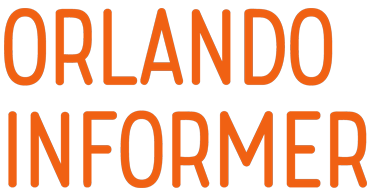 And in what is arguably the coolest sequence of them all, Fred and George Weasley temporarily take over Hogwarts, transforming it into a chaotic – yet still positively gorgeous – celebration of Christmas and their Diagon Alley store both. It’s not even eight minutes long, but The Magic of Christmas at Hogwarts Castle really is magical, the perfect capstone to a night filled with unbelievable holiday sights, sounds, and smells. Floridians had to wait nearly an extra year for some type of projection-mapping show to arrive – the parks in Osaka and Hollywood both received a different, non-seasonal production back in the spring – but the wait was well and truly worth it. As soon as Hogwarts reverted back to normal and the lights in the area came back up, we couldn’t wait to plunge into the immersive winterscape once again. 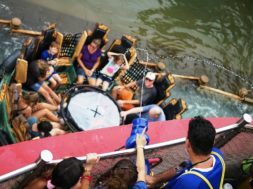 Forget the Dragon Challenge replacement coaster – Hogsmeade has a new attraction right now, and it’s quite a doozy. Read up on everything else that Christmas in the Wizarding World has to offer by visiting our in-depth, complete guide. 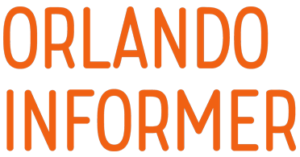 And for even more on Harry’s wondrous world, be sure to follow Orlando Informer on Facebook, Twitter, and Instagram. previous Wizarding World: Seventh chocolate frog card is arriving!